Normally, by now, I’ve got some things to do outdoors. This time each year, I’m piddling around in the leaf-covered gardens, turning over the deadness once more. But this winter’s extreme cold has shut everything down (including me). My paper-whites never bloomed, and my tea olive barely did. 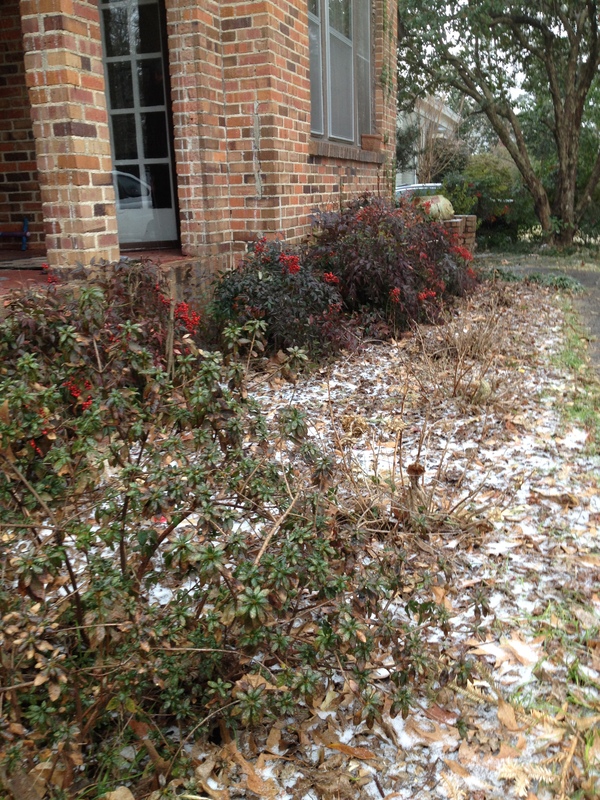 I had bundle up tight to go outside and cut back my althea and my crape myrtles. Yet everything isn’t withered up: the bridal wreath is blooming its tiny white flowers, the hollies and nandinas have shown their red berries, and the quince is trying to pop the little bits of bright pink onto its leafless branches. Last year, I rambled all winter about how the lack of cold was nice, but it was going to mean a horrible infestation of bugs come spring. And I was right. We got eaten alive last spring and summer by the swarms of mosquitoes that hide out in my nandinas and then attack us when we sit on the front porch or grill out in the back. Winter is only one-third done, and I can already tell we won’t have that problem this spring. The problems we will have may not be completely known until spring. When some dormant plant never does sprout leaves or buds, we will know that the cold killed it, and there will no point doing anything but digging it up. I’m already seeing uprooted sago palms with now-straw-colored fronds, lying at the curb, ready for the trash men to pick them up. Putting sheets over some of the tropicals can save them if it only dips just below freezing, but these 10s are too much for many of our plants that thrive in zones 8 and 9. The leaves on my nandinas have turned purple, and I’ve never seen them do that. I don’t dare turn over my compost because the worms and rolie-polies are burrowed down deep in there trying to stay warm. I need those little jokers! 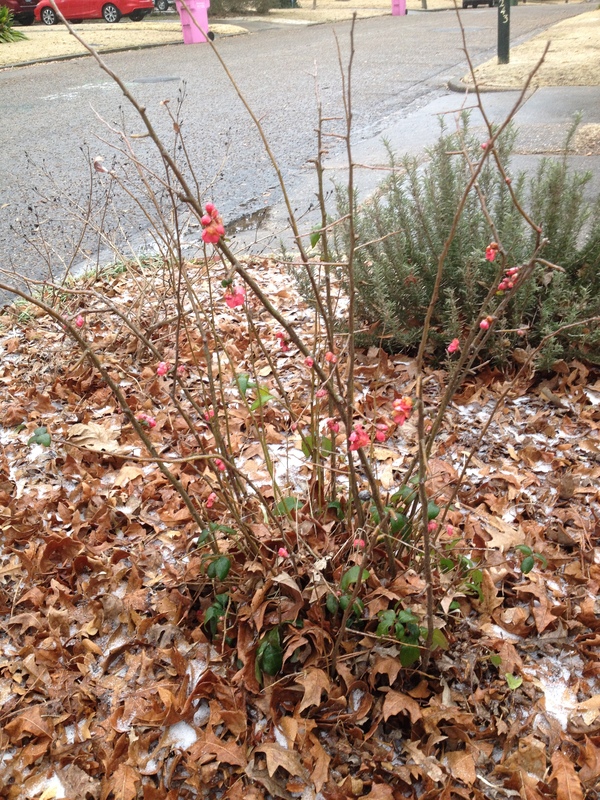 We (and our plants) just don’t know what to do in the Deep South when it gets this cold. In January, our normal temperatures are afternoon highs in the upper 50s and nighttime lows in the upper 30s. We have some hard freezes but they’re rare and spread out. This year, other than a day or two when we’ve had lower 60s, our highs have mostly been ten or more degrees below normal, with several hard freezes per week. I’ve seen reports saying that it hasn’t been this cold here in forty or fifty years— which means to me that I’ll likely never see it this cold again in my life. And that’s fine with me! But it’s not over yet. The forecasters said that we were about to get ice, sleet and snow all across the Deep South, yet another rarity, and here we have it. The last few days have been nearly normal, with sunshine and highs in the 50s, but another “arctic blast” has come. As this post publishes, I am stranded in the house with my wife and kids, all of us home from our respective closed schools. (On the bright side, there are kids around the Deep South stranded at their schools, and they and their teachers are preparing to spend the night there.) I wish I liked snow, but I don’t. Snow is no solace to me in cold weather. Please say a prayer for this Deep Southern homebody in these trying times, because I think I’m going to need all the help I can get.